Learn more about Casey International Speculator and the strategies Louis uses to pick winning junior miners. It’s always been true, as Bourne said, that “war is the health of the State.” But it’s especially true when economic times get tough. That’s because governments like to blame their problems on outsiders; even an imagined foreign threat tends to unify opinions around those of the leaders. Since economies around the world are all weakening, and political leaders are all similar in essential mindset, there’s good reason to believe the trend towards World War III is accelerating. Many politicians and pundits in the U.S. blame “those damn Chinese” for taking “our jobs” by filling Walmart with tons of cheap goods, and the swarthy ragheads for making the price of oil too high (usually, but now too low). The Russians, the Iranians, the Taliban (who will soon reconquer Afghanistan) and ISIS (which is carving out a new nation-state from the ruins of Syria and Iraq) are permanent members on the list of Bad Boys. But now, since the Obama regime has decided to “pivot to the East,” you can underline China’s name on that list. The “pivot” being the U.S. government’s new focus on meddling in Asia, as opposed to meddling in the Middle East and Europe. U.S. Defense Secretary Ash Carter says the U.S. will be the principal security power in the Pacific “for decades to come.” I’m sure the locals, including the Chinese, were thrilled to hear that. It’s said that the U.S. government has combat troops (or advisors, as highly trained special ops guys are usually euphemistically termed) in about 100 countries. It’s hard to keep track of their latest “intervention”…although “interference” is a better word. Note that I said “they,” not “us,” in reference to Washington. The city has a life of its own and its interests are not necessarily those of the country it rules. Let’s see…sending arms to a puppet government in Kiev to help put down a secession in Donetsk and Lugansk. Sending jets, and now ground troops, to Syria, which will quite possibly create an incident with the Russians. 150 soldiers to Uganda to fight the Lord’s Resistance Army and 300 to Cameroon to fight Boko Haram. And more troops to Iraq and Afghanistan to help out our “allies.” For the moment, they’re the best allies money can buy. It’s hard to keep track of them all, with something new almost every week. But, on the bright side, war is nature’s way of teaching Americans geography. So, with that in mind, we now have to learn where the Spratly Islands are. Let’s start with a map. You’ll note the red line. In 2012 China decided that the entire area, right up to the shorelines of Vietnam, Taiwan, the Philippines, Malaysia, and Brunei, was part of its economic zone. The governments of all those countries also have claims to parts of the South China Sea, and the Spratlys in particular. You’ll also note the Paracels, another zone of contention, between China and Vietnam. Believe it or not, from 1956 to 1972 (when he was jailed for his efforts) a Filipino businessman, one Tomás Cloma, also attempted to claim part of the Spratlys, and make it an independent country, Freedomland. This caught my attention, in that I was (very marginally) involved in three other island independence movements in the ‘70s: Nagriamel, Abaco, and Minerva. Those, however, are stories (all a mixture of tragedy, comedy, and pathos) for another day. Until very recent times, the Spratlys were best known as a hazard to navigation, with about 750 islets, reefs, and sandbars, total land area about 1.5 square miles, spread over about 160,000 square miles of the South China Sea. I’ve never been to the Spratlys. But their potential value is clear. It’s said up to 30% of the world’s fish catch comes from the South China Sea. And, almost needless to say, it’s conjectured that the area contains a lot of oil. But the U.S. government, although it, as usual, has no dog in the fight, has decided to get involved. The catalyst for it acting now is that China is in the process of transforming at least seven reefs into usably large artificial islands, several with long airstrips. I’ve looked at the history of who has used, and claimed ownership, of the islands over the centuries. All the adjacent countries have somewhat reasonable-sounding claims. And the Taiwanese, Filipinos, Malaysians and Vietnamese each have a military presence on one or more of the Spratlys. But only the recent Chinese efforts have drawn the U.S. government’s attention. Recently, they sent a guided missile destroyer, the USS Lassen, within the 12-mile limit of Subi Reef, which the Chinese are currently expanding. Reports are conflicting whether the ship was just innocently passing through, or trying to create a precedent. I’d like to ask, how do you, I mean you personally, feel about that? I’d like to know. Scores of millions of Asian locals, who’d previously never even heard of the islands, and certainly can’t find them on a map, are getting worked up because their governments told them the islands were “theirs.” And now the U.S. is further complicating the matter. But here’s my take. 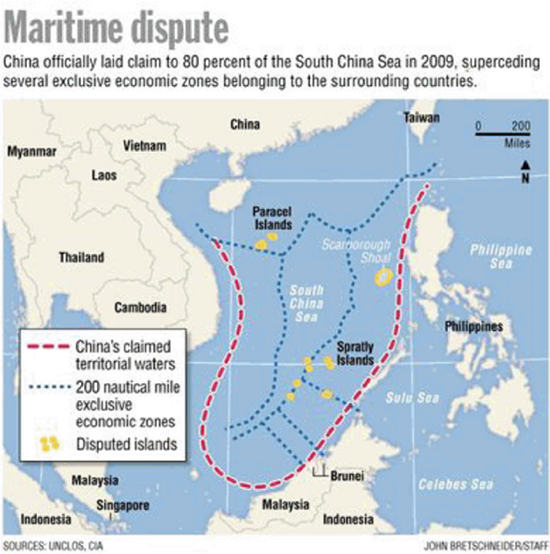 The Chinese seem quite out of line claiming the whole South China Sea as their economic zone. Shame on them. But how is that the problem of the U.S.? It’s the problem of the locals. Should the Chinese be able to build artificial islands? That’s a somewhat different question. I’d say, why not? Disputed or unclaimed land belongs to the person who uses it. One thing is for sure: the U.S. government is asking for trouble flying military aircraft off the coast of China and sailing warships into waters they claim. How would the U.S. react if Chinese planes and warships were often seen off the West coast? Or if the Santa Catalina or San Juan islands developed independence movements that the Chinese backed? The U.S. government feels pretty bold about its intrusion into the South China Sea, since no other government has a naval force even remotely comparable to its 12 aircraft carrier groups. But that boldness is foolish and unjustified. I’ve said for many years that those carriers are exactly analogous to battleships before World War II, or cavalry before World War I. They’re essentially sitting ducks, highly vulnerable to all manner of cheap, accurate missiles, both cruise and ballistic, that could swarm them en masse. It will be a huge embarrassment to Americans (but a treat to divers a couple generations hence) when they’re sunk, and sprouting barnacles like the Japanese fleet in Truk Lagoon. The U.S. knows that it’s China’s backyard, and they could sink any U.S. taskforce if they choose to. But they probably won’t. Why start a war when your enemy has a superior military, but you are growing your economy several times faster than he is? It makes more sense to wait…so it’s likely to remain a Mexican standoff, as opposed to an overture to World War III. But these things have a way of escalating unpredictably. In any event, it makes no sense to go to the other side of the globe just to provoke someone. In the meantime, the U.S. carrier groups are prestigious, and great for sticking the U.S. government’s nose into far-off places where it’s not welcome. But they’re hugely expensive, at about $6 billion a ship, plus another billion or two per copy for its half-dozen escorts, plus another $200 million for each of the 50 or so F-35 fighters they’ll soon carry. Plus a few billion a year to keep each group operational. Not to worry on that score; the Chinese will surely lend the U.S. government more money to enable that. There’s plenty of reason to be concerned about the roughly $1 trillion a year the U.S. spends on the military and “security.” Even though it’s more than the next 28 countries combined, it’s apparently not enough to keep America safe. In fact, it’s actually making the country less safe, by provoking and threatening other powers. And if it doesn’t start a war in the short run, it’s going to guarantee a U.S. bankruptcy in the slightly longer run. All the “hawks” running for president this year (which is to say, almost every candidate) seem oblivious to the fact that, in anything but the briefest conflict, economic power completely trumps military hardware. In conclusion, whenever you see a mention of the U.S. Navy and the Spratlys in the same paragraph, you’re seeing a reminder of an open vein helping to bleed America dry. And that’s the best case. Editor’s Note: Unfortunately, there’s little any individual can do to practically change the trajectory of this trend in motion. The best you can and should do is to stay informed so that you can protect yourself in the best way possible, and even profit from the situation. It shows you how to preserve and even grow your wealth during recessions, stock market collapses, and every financial disaster in-between. Weak oil prices have pummeled huge oil companies. The SPDR S&P Oil & Gas Exploration & Production ETF (XOP), which tracks the performance of major U.S. oil producers, has declined 36% over the past year. The Market Vectors Oil Services ETF (OIH), which tracks U.S. oil services companies, has declined 30% since last November. Weak oil prices have even pushed entire countries to the brink. Saudi Arabia, which produces more oil than any country in the world, is on track to post its first budget deficit since 2009 this year. If oil prices stay low, the country could burn through its massive $650 million pile of foreign reserves within five years. Canada is the world’s sixth largest oil producer. Oil makes up 25% of its exports. Last month, The Conference Board of Canada said it expects sales for Canada’s energy sector to fall 22% this year. It also expects the industry to record a net loss of about C$2.1 billion ($1.6 billion) in 2015. That’s a drastic change from last year, when the industry booked a C$6 billion ($4.5 billion) profit. Major oil firms are slashing spending to cope with low prices. Last month, oil giant Royal Dutch Shell plc (RDS.A) said it would stop construction on an 80,000 barrels per day (bpd) project in western Canada. The company had already abandoned another 200,000 bpd project in northern Canada earlier this year. Its economy exploded, thanks to the booming market for Canadian tar sands. Tar sand is a gooey sand and oil mixture that melts down with heat from burning natural gas. More than half of Canada’s oil production comes from tar sands. In Alberta, they account for 75% of oil production. Tar sand is generally more expensive to produce than conventional crude oil. Canadian tar sand projects made sense when oil hovered around $100. But many of these projects can’t make money when oil trades for $45/barrel. Last year, Scotiabank (BNS) said the average breakeven point for new Canadian oil sand projects was around $65/barrel. This is why giant oil companies are walking away from projects they’ve spent years and billions of dollars developing. Alberta lost 63,500 jobs from the start of year through August. It hasn’t lost that many jobs during the first eight months of the year since the Great Recession. The decline in oil production is also draining government resources. Last month, Reuters reported that Alberta was on track to post a $4.6 billion budget deficit this year. Economists say it could be another five years before Alberta runs a budget surplus. Calgary is home to 1.2 million people. It’s the largest city in Alberta and the third largest in Canada. Vacancy is already at a five-year high in Calgary and rents are the lowest since 2006 after thousands of office jobs were cut. In downtown Calgary, the vacancy rate jumped to 14 percent in the third quarter, the highest since 2010 and compared with 5 percent for downtown Toronto, according to CBRE Group Inc. .... That doesn’t include as much as 2 million square feet of so-called "shadow vacancy" or space leased but sitting empty, which would push vacancy to 16 percent, the most since the mid-1980s. Demand for office space is falling because of massive layoffs in the oil industry. That’s because oil companies didn’t just lay off roughnecks. They also laid off oil traders and middle managers, which means they need a lot less office space. But it looks like Calgary’s property crisis is just getting started. Bloomberg Business reports that the city has five new office towers in the works. These projects will add about 3.8 million square feet to Calgary’s office market over the next three years. More office space will only put more pressure on rents and occupancy rates. Real estate developers likely planned these projects because they thought Canada’s oil boom would last. It’s that same thinking that made oil companies invest billions of dollars in projects that can’t make money when oil trades for less than $100/barrel. In September, Doug went to Alberta to assess the damage first-hand. E.B. Tucker, editor of The Casey Report, joined Doug on the trip. E.B. went on record saying Canada was in for “a major wakeup call.” He still thinks that’s the case. In fact, he thinks the situation is going to get a lot worse. When we were in Alberta, we heard over and over again "It'll come right back...it always does." It's not coming back. I expect the situation to get worse. And I see the Canadian dollar going much lower. Vacancy rates are rising in Canada’s heartland cities. Jobs in Alberta are disappearing. Unemployment is climbing. And there’s still a global oversupply in oil. None of this bodes well for Canada’s economy. Canada’s economy is in a midair stall. The locals certainly didn’t grasp this when we visited Alberta last month. That's usually the case when things are going from bad to a lot worse. QE is when a central bank creates money and pumps it into the financial system. It’s basically another term for money printing. Since 2008, the Fed has used QE to inject $3.5 trillion into the U.S. financial system. If the Fed’s experience with QE is any indication, money printing wouldn’t help Canada’s “real” economy much. But it would inflate asset prices. That, in turn, would only make Canada’s economy even more fragile. You can read all about Doug and E.B.’s visit to Alberta by signing up for a risk-free trial of The Casey Report. You’ll even discover how to make money off the oil industry, despite the collapse in the price of oil. Click here to learn more. The article The “Bloodbath” in Canada Is Far From Over was originally published at caseyresearch.com. Louis James: If we end up in a totalitarian police state or nanny state, I don't want my children to lift their manacled wrists before my eyes and ask me why I didn't resist while resistance was possible. Doug: Indeed. In spite of the blatantly obvious and disastrous results of Prohibition, politicians have declared open season on drug users, then smokers, then gun owners - All Things Fun. How far can it be from regulating politically incorrect eaters to regulating just about everyone's choices on every subject? Doug: And it gets worse. Now that we have socialized medical services in the U.S. (which is not the same as health care), genuine bad health choices that used to be individuals' problems have become everyone's problems, because we all have to pay for them. Socialized medicine is terrible; it's entrusting medical services to the same bankrupt organization that can't even deliver the mail reliably. It's also a powerful excuse for the nanny state to monitor, inspect, interfere with, and control all aspects of our lives, from what we eat and drink all the way down to what we do in the privacy of our bedrooms...because everything can impact our health, which is now society's obligation. Doug: If it saves one child, how many children does it kill? If you ban Freon over an unproven fear that it contributes to ozone depletion, for example, and require use of a more expensive, less efficient, and incidentally more toxic and corrosive substitute, all because it might save one child, how many babies did you kill with spoiled milk and meat? What other consequences to your intervention are you ignoring? This reminds me of the time Madeleine Halfbright was told that the sanctions she saw imposed on Iraq had killed about half a million children, and she answered: “Yes, it was costly, but we think it was worth it.” These people are hypocrites, and extremely dangerous. Sociopaths. They don't care about saving human lives; they are more than willing to expend any number of them, like pawns on a chessboard, to advance their quest for power. L: Bastiat's broken window all over again: “the seen and the unseen.” But you've got to have a good cover story, like saving children's lives. Doug: Of course. If you say you're doing it for the children, you can get away with almost anything. L: Clearly, you don't subscribe to the precautionary principle, the idea that no new technology or innovation should be implemented until it can be shown to be safe. Doug: It's a load of horse manure, and you can quote me on that. Doug: Good! If our ancestors had been stupid enough to adopt such an absolutely paralyzing idea, we'd still be shivering in caves, ravaged by dread diseases, and hunted by animals larger and more powerful than we. No, I misspeak; most likely, we'd have gone extinct. If the car were invented today, it would never be approved for use. The idea of millions of people racing towards each other at high speeds in vehicles they control themselves, with tanks full of explosive gasoline…it would never make it through OSHA, EPA, or a dozen other agencies. The idea of air travel, forget about it. We're just lucky these things were in common use before the nanny state came into its own. L: Extinction…another strong statement. That's what you think would happen now if the precautionary principle were adopted and enforced by law? Doug: 'Fraid so. Life without risk is a patent impossibility. Almost a contradiction in terms. And life without risk, innovation, new horizons, would hardly be worth living. But that's the way the world is headed. The issue of the student's call for expanding the U.S.'s socialized medical system to include free birth control, however, is a suitable issue for conversation. The costs affect us all, and it's another tightening of the grip of the nanny state on people's lives. All this squabbling over what should be paid for by the state would be eliminated if nothing were covered at “public” expense (i.e., using other people's money). But most people don't even think about that possibility. We've already beat up on Limbaugh, so we don't really have to go there, but while it's on my mind, I have to point out that he really showed what an ignoramus he is when he defended Joseph Kony and the Lord's Resistance Army last year. He apparently thought they were Christians fighting Muslim tyrants, not the kidnappers and murderers the preponderance of evidence says they are. There's a video about Kony that's gone truly viral on YouTube, with over 75 million views in just one week. The fact that an ignorant hypocrite like Limbaugh, who wanted to have drug users executed even as he was getting phony prescriptions for his Oxycontin habit, has such a large following is another sad sign of our times. It's not just the socialists advocating the nanny state who are the problem. So-called right-wingers are just as dangerous to personal freedom as left-wingers. L: Any way to stop this train wreck? Doug: None. It's like I said to begin with: This is a sign of advanced decay in a society that has lost its élan. It's not something you can fix independently of fixing the whole rotten mess; nanny-state thinking goes hand in hand with the entitlement mentality, which goes with irresponsible and self-destructive behavior. That accelerates the other, “male” side of ever-expanding state power that people like Limbaugh favor: The warfare state; the paternalistic, authoritarian state. The bottom line is that, with more than half the U.S. population on one form of government dole or another, we've crossed the point of no return. We're going to have to go through the wringer before things can improve. The current situation is unsustainable. It's going to collapse. Incidentally, as unpleasant and inconvenient as it will be, a collapse and reboot is necessary and will be a good thing. Hopefully, it will destroy the nanny state, if only because the nanny state is a dead hand on the development of technology. The most positive thing going on in the world today is the advance of technology. But, just as the car and the airplane likely couldn't be developed today because of the safety-first nanny state, there are lots of other technologies that won't ever come into existence, and we might never know it. Our conversation on technology is an example of what I mean by that. Anyway, we've got to pay the piper first…and the bill is rapidly coming due. L: [Sighs] Okay, before we go all poetic, are there investment implications to the rise of the nanny state? Doug: Yes. On the wealth-preservation, and health-preservation, side, it's vital to understand that today's wealthy Western countries are increasingly hazardous to the well-being of the people who live there. They have the power and the motive to do harm to any citizen as suits the short-term goals of those in office. That's long been the case financially and is increasingly becoming the case physically, both in terms of health and safety from police brutality. Just as we said last week in our conversation on cashless societies, the time is approaching, if not here already, when the wisest course of action is to get out of Dodge…or at least out of countries with powerful governments. On the investment side, the West's increasingly irrational attitudes about meat may create more buying opportunities in the cattle business. Even if every single person in the U.S. stopped eating meat, those eating more in China and the rest of the developing world would make up the difference before long. At the same time, herds continue to go into liquidation in the West. Cattle have been in a bear market for many, many years, making it one of the best contrarian plays in decades. That's why I'm building my own herd: I'm buying low so I can later sell high. But we've talked about that before. Like any good speculator, I plan on making a lot of money while performing a public service. Other implications are as we've discussed many times: Buy gold and silver, speculate on gold and silver mining stocks, own long-term energy plays and technology plays that will do well in hard economic times, harden your assets, and diversify yourself internationally. L: Well then, I think our readers know what to do. Thanks for another interesting conversation. Doug Casey is a multimillionaire speculator and the founder of Casey Research. Today, Doug predicts that we're headed into the worst financial crisis of the last 100 years. His latest book, Going Global 2015, is a groundbreaking step-by-step manual on how to survive - and even prosper - during the coming financial crisis. In this book, New York Times best-selling author Doug Casey and his team describe the three ESSENTIAL steps every American should take right now to protect themselves and their family. These steps are easy and straightforward to implement. You can do all of these from home, with very little effort. Normally, this book retails for $99. But this book is so important, especially right now, that we've arranged a way for U.S. residents to get a copy for just $4.95. Click here to secure your copy. The article Doug Casey on the Nanny State’s Interference in Our Lives was originally published at caseyresearch.com. Editor’s Note: As you may have heard, the World Health Organization (an arm of the United Nations) issued a major report this week. The report claims that eating processed meat, like bacon, causes cancer. The report also says eating any kind of red meat may cause cancer. Louis James: Doug, you're going to love this. There's a new study out purporting to show that eating any amount of any kind of red meat is bad for you; making you 13% more likely to die, in fact. So, with your growing herd of cattle in Argentina, you're close to becoming a mass murderer. Doug: I saw that. I wonder what you have to do to make it 26% more likely to die. If I go back to skydiving, does that mean I'm 1,000% more likely to die? It's rather strange, in that I always thought we're all basically 100% likely to die. It's yet another sign of how degraded U.S. society has become, that something so ridiculous can be passed off as news. According to the LA Times article I read, the "study" was just a survey of people's reported eating habits. So, at best (assuming people responded accurately and honestly) the survey might show us a correlation. But even a high-school student should be able to tell you that correlation does not establish causality. The typical science journalist may be even more ignorant and misinformed than the typical financial journalist, which is saying something. It's why I read the papers mostly for entertainment. "This study provides clear evidence that regular consumption of red meat, especially processed meat, contributes substantially to premature death … On the other hand, choosing more healthful sources of protein in place of red meat can confer significant health benefits by reducing chronic disease morbidity and mortality." Doug: It sounds as if the authors might have a political agenda. But what do you expect from government "science?" Much of it is politically driven, and if you don't arrive at politically correct answers, funding might dry up. Doug: Sure it was—but paid for by a branch of the U.S. government health bureaucracy, the NIH. These so-called scientists may well be hacks who got paid a lot of money because they were deemed likely to deliver a result that meshes with the agendas of various politically correct groups. One of those is the anti-meat fanatics, including the animal rights activists at PETA; they're relatively few in number but very strident. Another is the environmentalists who fear the methane cows and sheep produce; because methane (CH4) is a "greenhouse gas." They believe it will turn this rock with its thin skin of an atmosphere, floating in the cosmos where the average temperature is a couple degrees above absolute zero, into an inferno. Actually, termites and decomposing vegetable matter emit hundreds of times more methane than domestic animals…not to mention volcanoes. I'm of the opinion that these greens don't really love animals; what's really going on is that they hate people in particular and life in general. Anyway, these types have taken to using science as a cover. There should be a separation of science and state, for the very same reasons there should be a separation between church and state. L: What would you say to people who say you're biased because you're in the cattle business? Doug: Yes, the busybodies have convinced Boobus americanus that anyone who actually makes his living dealing with nature shouldn't say anything about it. People who mine minerals, drill for oil, farm, grow animals…people who actually know something about these things, and make them available for use have largely been intimidated into silence. They're commercial, and to be commercial is bad, QED. Of course, that's a completely insane attitude. But the self-righteous busybodies have managed to claim the moral high ground and discredit the producers. They've done this by capturing the government, academia, and the media. Anyway, I'd say the average "consumer" (which is itself a perverse and degrading way to describe a person) should start using what's left of his own brain instead of relying on experts, whether those be government-stooge scientists or…me. Just think about it: humans evolved over millions of years eating meat, and as much of it as they could get, whenever and wherever it was available. The conclusion of the anti-meat study, at least as broadly stated in the press, has serious credibility problems on its face. L: The study does make a point of saying that processed meats, like hot dogs, are supposed to be much worse for us. That would seem to have some face validity. Doug: Yes, I can see that. When you're providing mass quantities of stuff for the masses through industrial processes, it seems inevitable that all kinds of additives, chemicals, and preservatives will get into the mix. Indeed, how much pure beef remains in a typical modern hot dog? I think they're mostly cereal and artificial flavoring these days, plus a good measure of the "pink slime" the USDA puts into lunchmeat for school kids' government-mandated meals. Equally important, in my view, is that almost all meat these days is from cows raised on unnatural diets, pumped full of steroids and antibiotics, eating cardboard and unnatural food, living miserable lives, shoulder-to-shoulder in feedlots. How many survey respondents would know or care what kind of chemicals and pharmaceuticals went into the meat they are eating? I doubt they could give accurate answers to such questions, if they were even asked. I'd guess the researchers didn't even bother. Trends in demonized foods are like trends in fashion. For some time, salt was the greatest bogeyman…until some people, particularly an Iranian doctor I once knew named Batmanghelidj, pointed out the obvious, namely that salt is essential to life, and that problems attributed to too much salt are usually problems with not enough water. You need a lot of water washing through your cells. But anything in excess can be a problem, including water. If it's not salt, then it's sugar. If it's not sugar, then it's fat. Red meat has had its turn as demon du jour before, and it looks like it coming back into fashion again. L: I see Dr. Batmanghelidj's book on Amazon: You're Not Sick, You're Thirsty. I remember the salt scare; that was a big thing back in the '70s, as I recall. The odd thing is that post-scare, salt still seems to have a bad name, but consumption has moved toward gourmet salts. Plain old iodized Morton's salt is not to be found in certain politically correct cupboards, but sea salt or rock salt you grind yourself is acceptable. Doug: Yes, rich people can't be denied their gourmet designer salts, even though what we generally call "salt" is made of sodium and chlorine: two of the deadliest elements on the periodic table. It's all part of the War on the Periodic Table of the Elements. Plutonium was perhaps the original enemy element, then uranium, then sodium. Gold is considered an evil element by many. Now the most evil element of them all is carbon, which is the essential component of all organic matter, and hence all life on this planet. L: Hm. Now that you mention it, sodium ends in –ium, like thorium, so it must be bad. Doug: Yes, and if it weren't for government policy, we'd likely be generating power from thorium instead of uranium; it's a much better fuel. But that's another story. I'm sure that once the Greens discover that its atomic number 90, it, too, will join the enemies list in their general war on the periodic table. This reminds me of all the government-funded crash programs to find the cause of AIDS. Lo and behold, they found one and called it the Human Immunodeficiency Virus (HIV). But as I understand it, there are people who have AIDS and no HIV, and there are people who have HIV and never show any symptoms of AIDS. And yet, to question the HIV orthodoxy is to invite accusations of being a "denialist," homophobe, and maybe even a remover of those tags you're not supposed to take off mattresses under penalty of law. Fortunately, the AIDS hysteria, which was supposed to destroy the human race, has pretty much burned itself out. And then there's the "overwhelming evidence" of anthropogenic global warming that fearmongers proclaim. Again, with a lot of government "science" involved. It's turned into an industry that destroys capital. If we could get the state and its corrupting influence completely out of the science business, I'd be much more inclined to accept what the majority of scientists believe on "soft" sciences, like climate studies and epidemiology. Those things aren't at all the same as physics and chemistry; they're far above things like psychology and sociology, but hardly in the same class with mathematics. Certainly, as long as there's government money with a political agenda involved, I'm inclined to take so-called consensus views with at least a grain of gourmet sea salt, or even as possible contrary indicators for the truth. L: That's a pretty strong statement, Doug. Doug: It pays to be skeptical…about everything. Most of the reading that I do is either science or history, so I consider myself fairly knowledgeable in those areas, although I'm not a professional in either. But I didn't say I would refuse to believe anything supported by solid evidence just because I didn't like its source. I said that if the data comes from what I regard as a corrupt source, I proceed with greater-than-usual caution. Although the corruption of science is very bad, what's even worse is the continuing and accelerating encroachment of the "nanny state." This meat study—and others like it—can easily be used to manufacture a scare. The scare will then be used to implement more laws and restric­tions on people's freedom to live their lives as they see fit… and to destroy another industry. One example of that is the FDA's campaign a­gainst farmers who sell unpasteurized milk to those who prefer it. L: So, whether or not red meat is good for us, we all have a natural or God-given right to eat what we want and go to hell in our own way? Big Brother, step aside, Big Momma is gonna make us eat our veggies. Doug: Exactly. I'm of the opinion that quality of life trumps quantity of life. That's the exact opposite view from what rulers and would-be rulers hold; they view the rest of our species as milk cows, to be kept alive and milked for as long as possible, no matter how much joy is taken from them. The purpose of life, however, is to enjoy yourself. It's not to be treated like part of a herd and be fed what your master wants for his own purposes. L: Is that why is it that politicians bother meddling with whether people eat hot dogs or salads? Doug: That, among many other reasons, they can win brownie points with very vocal activists if they beat up on an unpopular personal choice, like smoking. That's very valuable to them come election time. Politicians, with the possible exceptions of the likes of Ron Paul, always want to increase the state's (and thereby their own) power. Any scare is a great tool for manipulating people into handing over more of their freedom, which is to say, increasing their power over people. Doug: Right. That's an important book everyone should read. The whole trend is very ominous. It's as Martin Niemöller said during WWII: "First they came for the communists, but I didn't speak out, because I was not a communist." L: "And then they came for the Jews ... And then they came for me, and there was no one left to speak out for me." Doug: Right. I believe in speaking out, even though it probably doesn't do any good. I do it because I have to live with myself. I do it because I believe in karma. L: If we end up in a totalitarian police state or nanny state, I don't want my children to lift their manacled wrists before my eyes and ask me why I didn't resist while resistance was possible. The article Doug Casey on the Nanny State was originally published at caseyresearch.com. One of America’s largest companies is taking a controversial stance on employee benefits. In a move that is sure to draw criticism from the mainstream press, Jonathan Johnson, chairman of online retail giant Overstock.com (OSTK), publicly stated that the company has stockpiled gold and food in preparation of a U.S. financial crisis. Quantitative easing (QE) is when a central bank creates money from nothing and injects it into the financial system. It’s basically another word for money printing. Johnson went on to explain the company’s preparations. So what do we do as a business so that we would be prepared when that happens? One thing that we do that is fairly unique: we have about $10 million in gold, mostly the small button-sized coins, that we keep outside of the banking system. We expect that when there is a financial crisis there will be a banking holiday. I don't know if it will be two days, or two weeks, or two months. We have $10 million in gold and silver in denominations small enough that we can use for payroll. We want to be able to keep our employees paid, safe, and our site up and running during a financial crisis. • Longtime Casey Research readers are familiar with our stance on financial crisis preparation. Just like it makes sense to wear a seatbelt…just like it makes sense to buy home insurance…it makes a lot of sense to stay prepared and own insurance against a major financial catastrophe. Right now, this kind of preparation has never been more important. In other words, we think Overstock's moves represent sound thinking. In an unprecedented monetary experiment, global central banks have kept interest rates at near-zero levels and printed trillions of new currency units since the 2008 financial crisis. All this “easy money” has warped the global economy and led to trillions of dollars in malinvestment. We can’t say when this will end, but we can say with certainty that it will end badly. For the sake of your family and friends, we hope you’re taking some simple steps to prepare. While governments and central bankers can destroy the value of paper currencies, they can’t hurt the value of gold. Gold has held its value through every financial crisis in history. That’s why humans have been using gold as a store of value for thousands of years. We also recommend keeping plenty of cash on hand. Unlike gold, cash will likely lose at least some value during a crisis. But when a crisis hits, you may need cash to pay for everyday goods and services. During the Greek financial crisis, the Greek government declared a “bank holiday.” The government closed all the banks in the country to prevent everyone from pulling their money out and crashing the banking system. Even after the banks reopened, the Greek government set strict daily limits on how much money people could withdraw from ATMs. For weeks, Greek people could only withdraw €60 ($67) of their own money per day from ATMs. Putting money in a foreign bank account is a smart way to move some of your money outside your home country. If your home country has a bank freeze, you’ll still be able to access your cash that’s held in a foreign bank account. If you’re not sure how to get started, we recommend reading Going Global 2015. This hardcover book explains in detail everything you need to know in order to open a foreign bank account. It includes details on the one country that has never had a bank failure, where it’s easy for Americans to open a bank account. Going Global 2015 will even tell you about a bank in this country where you can open an account starting with just $400 (on page 120). And that’s just one chapter. As Casey Research’s “financial survival guide,” Going Global 2015 will walk you through all the best ways to protect your money. Thousands of people have paid $99 for this book. Right now, we’re giving it away for just a $4.95 processing fee. Click here to claim your copy. The article One of America’s Largest Companies is Stockpiling Food and Gold for the Next Financial Crisis was originally published at caseyresearch.com. 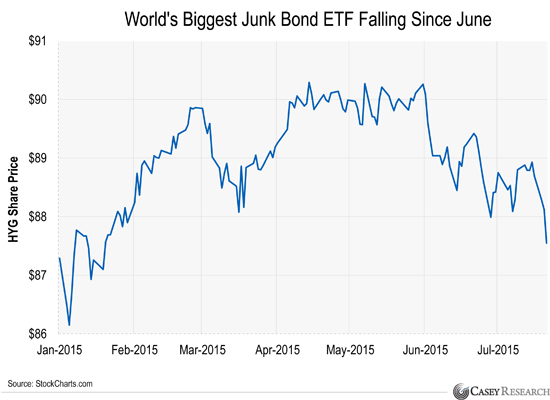 The S&P 500 fell 8%...and so did the Dow and the NASDAQ. It was the worst quarter for U.S. stocks since 2011. The article We Have Some Bad News was originally published at caseyresearch.com. Ray Dalio is the founder of Bridgewater Associates, the world’s largest hedge fund. Dalio manages nearly $170 billion in assets. He has one of the best investing track records in the business. When he speaks, we listen. Dalio has been saying for a long time that governments and businesses around the world have borrowed far too much money. He thinks their high levels of debt have created an extremely fragile and dangerous situation. The stats back up Dalio’s view. In the United States, government debt as a percentage of gross domestic product (GDP) is 102%...its highest level since World War II. Countries around the world are in a similar position. Japan’s debt-to-GDP ratio is at 226% and climbing. In Italy, government debt/GDP jumped from 100% in 2007 to 132% in 2014. Quantitative easing (QE) is when a central bank buys bonds or other assets to lower interest rates and boost asset prices. It’s mostly just another name for money printing. The Fed started QE in a desperate attempt to stave off disaster during the 2007-2008 financial crisis. It launched the first round in November 2008…a second round in November 2010…and a third round in September 2012. It stopped its last round of QE last October. 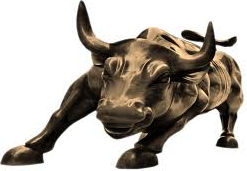 The first three rounds of QE fueled a big bull market in US stocks. The S&P 500 has gained 113% since the Fed started QE in 2008. Dalio thinks the Fed should bring QE back. It’s a bold call, and one that most economists disagree with. Most economists expect the Fed to raise rates soon. Raising rates would tighten monetary conditions…essentially the opposite of QE. Dalio thinks the Fed will raise rates, even if it’s just to “save face.” He pointed out that the Fed has threatened to raise rates so many times that not raising rates would hurt its credibility. Dalio’s big concern is that the world is too indebted to handle a rate hike. He thinks it could cause a financial disaster like a stock market crash, or worse. In a letter to clients earlier this year, Dalio made a comparison to 1937, when the world was in a similar situation of having way too much debt. He explained that the Fed made a huge mistake by raising rates, and it caused the stock market to plummet 50%. The danger is that something similar could happen if the Fed raises rates today. I don’t know what the Fed’s going to do. That’s a guessing game. What’s important is Dalio’s point that we’re in an extremely fragile situation. The world has too much debt, and the Fed’s margin for error is tiny. If it takes a wrong step and stocks plummet 50%, it could cause a bigger financial crisis than in 2008. So the real question is, do you trust the US government and the Fed to manage this dangerous situation? I don’t. This is the same Fed that blew two huge bubbles in the last twenty years. First the 1999 tech bubble…then the even bigger housing bubble, which almost took down the whole financial system when it popped in 2007. And keep in mind – this is all a gigantic experiment. The Fed is using tools, like QE, that it had never used before the financial crisis. No one in the Fed, the US government, or anywhere else knows how this is going to work out. Who knows…maybe the Fed will surprise us and successfully guide the economy through this dangerous period. But that’s not an outcome I’d bet my savings on. One, own physical gold. Unlike stocks, bonds, or cash, it’s the only financial asset that has value no matter what happens to the financial system. Two, put some of your wealth outside the “blast radius” of a financial crisis. We wrote a new book with all of our best advice on how to do this. And we’ll send it to you today for practically nothing…we just ask you to pay $4.95 to cover our processing costs. Click here to claim your copy. The article Why Stocks Could Fall 50% if the Fed Makes the Wrong Move was originally published at caseyresearch.com. You won’t hear about this from the mainstream media. Networks like NBC or CBS don’t have a clue… just like they didn’t have a clue the US housing market would collapse in 2007. And this investment isn’t some complex derivative that only Wall Street and hedge funds can buy. Millions of investors hold it in their brokerage accounts. The dangerous investment is junk bonds. Junk bonds are usually issued by companies with shaky finances. They pay high interest rates to compensate investors for their high risk. Low interest rates have pushed investors into these risky bonds. Junk bonds are one of few places where investors have been able to get a decent income stream. 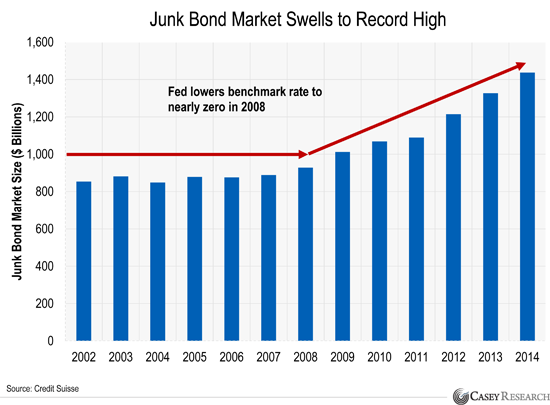 In 2008, the Federal Reserve cut interest rates to near zero to fight the financial crisis. It has held rates near zero ever since. Right now, a 10-year US government bond pays just 2.3%. That’s half its historical average, and near its all-time low. JPMorgan reports that the number of junk bond issues soared 483% between 2008 and 2014. You might be thinking that you don’t own junk bonds… so why should you care? It’s true that many investors don’t own junk bonds directly. But many do own them through junk bond ETFs. 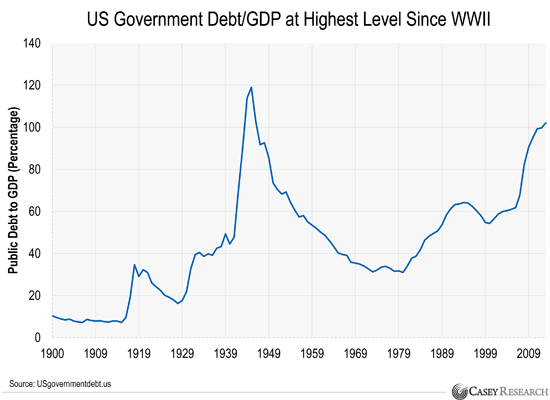 … junk bond ETFs give the illusion of liquidity. Not all that long ago, bankers and asset managers promised to turn subprime mortgages into gold-plated, triple-A rated bonds. Today, the apparently miraculous transformation is of deeply illiquid credit instruments, such as junk bonds and leveraged loans, into hyper-liquid exchange traded funds. Junk bonds are not “liquid.” That means there aren’t many investors buying and selling them every day. The Wall Street Journal reported that each of the top 10 bonds in the largest junk bond ETF traded just 13 times a day on average. That’s not a typo. Investors only buy and sell these junk bonds 13 times per day on average. For comparison, investors buy and sell 47 million shares of Apple (AAPL) on average every day. Junk bond ETFs are extra dangerous because they make junk bonds appear liquid. HYG, the largest junk bond ETF, trades more than 6.8 million shares per today on average. That’s more than McDonald’s stock. No investment vehicle should promise greater liquidity than is afforded by its underlying assets. If one were to do so, what would be the source of the increase in liquidity? Because there is no such source, the incremental liquidity is usually illusory, fleeting, and unreliable, and it works (like a Ponzi scheme) until markets freeze up and the promise of liquidity is tested in tough times. Because junk bond ETFs create the illusion of liquidity, most investors don’t see the danger. They think they can sell their junk bonds ETFs just as easily as they could sell shares of Apple. They’re wrong. If too many people sell junk bonds at once, it could overwhelm the market and cause prices to crash. Now, none of this has been a problem yet because junk bonds have been in a bull market. According to Bank of America, junk bonds have gained 149% since 2009. All bull markets eventually end. When this one ends, junk bonds could cause huge losses to investors who don’t know about these risks. Junk bonds could easily drop 15% or more in one month. Some of the world’s smartest and most successful investors are are betting on this exact outcome. They’re betting that the junk bond market will crash. You probably heard about the few hedge fund managers who made a killing when US housing collapsed in 2007. Dallas-based hedge fund manager Kyle Bass made $500 million by betting against housing. John Paulson made $4.9 billion by betting against mortgages. Today, one of the largest private equity firms in the world is raising money to bet against junk bonds... just like Bass and Paulson bet against housing in 2007. Other hedge funds like Reef Road Capital and Howard Marks’ Oaktree Capital are also raising money to bet on a junk bond crash. There’s no way to know if this is the beginning of the end of the junk bond bull market. But if it is, huge losses could come very soon. If you’ve made money investing in junk bonds, it’s time to cash in. Don’t bet against some of the best investors in the world who expect junk bonds to crash. We recommend selling junk bonds now. P.S. Because this risk and others have made our financial system a house of cards, we’ve published a groundbreaking step-by-step manual on how to survive, and even prosper, during the next financial crisis. In this book, New York Times best-selling author Doug Casey and his team describe the three ESSENTIAL steps every American should take right now to protect themselves and their family. The article The Next Financial Disaster Starts Here was originally published at caseyresearch.com.